This Summer, I started teaching my daughter how to sew. We started out with clothes, but what she was even more excited about was the fun crafty projects we found in the Spoonflower Quick Sew Project Book. Have you gotten your copy yet?! What are you waiting for? Head on over to Spoonflower and grab one. I’ll wait…. (paints nails) Ok! What an awesome book! 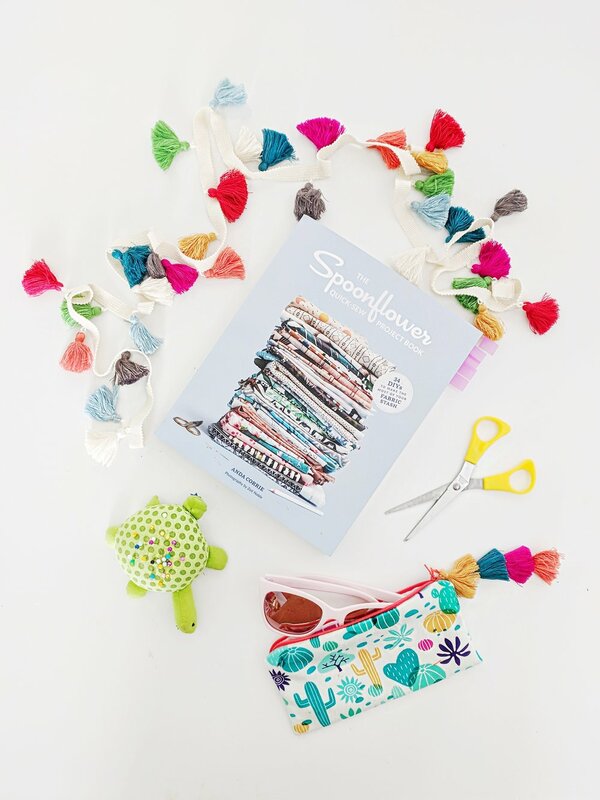 This book is great for my daughter and I. I am teaching my daughter to sew and this book came at the most opportune time. There are plenty of fun projects for her and I to sew and it makes sewing so much fun for her. The instructions are easy to follow and the imagery for each project makes you want to try them all. 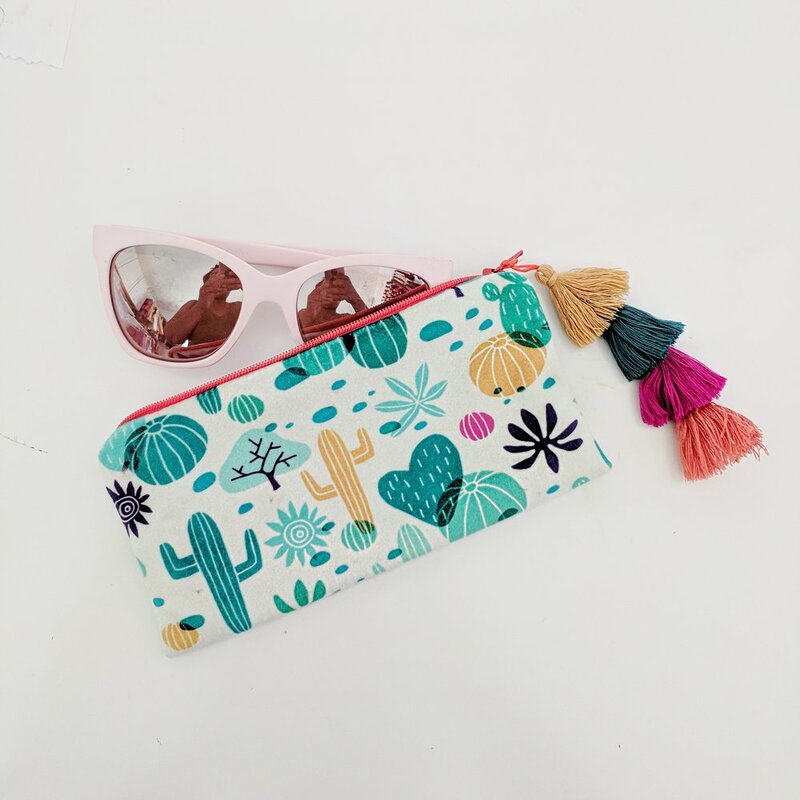 Also, I wanted to mentioned that Spoonflower was so gracious enough to give my readers a 10% off coupon code that is valid on one order of fabric, wallpaper and gift wrap. The code is QuickSewTabitha10 and expires on December 31, 2018. 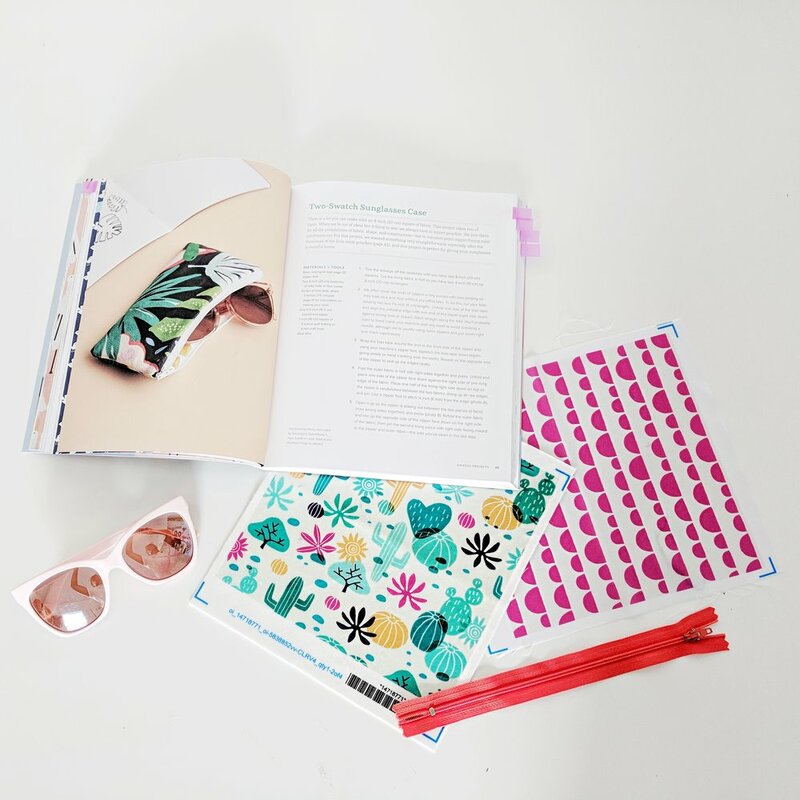 For the first project my daughter and I accomplished was the sunglasses case found on page 49 in the book or you can view the tutorial here. It’s so great because it only requires two 8 inch squares of fabric. So if you have any scrap fabrics and you are learning to sew or teaching someone, this is a great project to start with. As you all know, I always like to take a project and amp it up a bit. When you create projects in this book, find a way to make it YOU! You know that I’m “extra“ so I decided to add a fun element to the zipper. Today I’l show you how to create a zipper pull to add onto your sunglasses case. Remove the tassels from the trim. Thread about 15 inches of embroidery floss into a needle. Starting at the ball of your tassel, push the needle and floss through all of your desired tassels. Once all of the tassels are threaded, tie two knots at the end of the embroidery floss to prevent the tassle from falling off and cut the excess string. On the opposite end, tie two knots as well to create a loop. Thread it through the hole on the zipper pull and your finished! Use positive affirmations along the way. Let them know how well they are doing. Parents, if you are getting frustrated, take a 5 minute break and come back. Remember, it’s supposed to be fun and your child will always remember this time shared with you.